8 year/s ago 1570 Visit WebsiteNon-EnglishBroken link? 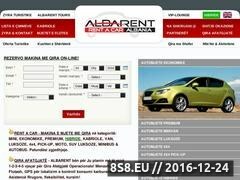 ALBARENT, is the latest vision in the market of rental vehicles and chauffeur-driven rentals in Albania. When Form and Function are Important ALBARENT offers a full range of luxury vehicles from its COOL CAR COLLECTION. Authorized drivers of rental vehicles, chauffeurs, provide a range of services and added convenience. The chauffeur meets you at the airport arrival, hotel or business meeting, transports you between engagements, takes you anywhere you’d like to go. ALBARENT with the support of PORSCHE ALBANIA and ALBATRANS offers the most interesting and full fleet of rental vehicles in categories: ECONOMIC, PREMIUM, MINIVAN, LUXURY, 4X4, LUXURY 4X4, MINIBUS AND BUS. Sorry, BrowseInter.net Website Directory does not contain yet any other websites related to Makina me qera, Makina te lira per shitje or Makina te perdorura te reja!